The Australian state of New South Wales (NSW) has a rich history of organised interest in the UFO subject. It proceeds from the solitary interest of one individual Edgar R. Jarrold, when he began Australia’s first public civilian UFO group – the Australian Flying Saucer Bureau (AFSB) – in July 1952, through to the myriad manifestations we have now. This article will focus on these NSW responses to the UFO mystery. Edgar Jarrold, widely viewed as the pioneer or father of Australian ufology, in his own words was just an “interested observer of the first 1947 sightings of weird aerial objects.” That interest deepened in May 1951 when Jarrold (then a 32 years old foundry worker) had his own sighting of “something very unusual in the night sky” from a Sydney suburb. He indicated, “There were two of them – flying saucers I mean. They appeared as fast moving yellow lights. One followed the other. I rang the papers about it and found that many other people had seen saucers at the time.” He felt the bright objects were under intelligent control, but “appeared to possess no solid body sustaining them.” Following personal investigations of his own sighting and other reports Jarrold was surprised that “no body existed in Australia for the purpose of recording and correlating all available data regarding the strange apparitions,” so on July 31, 1952, Jarrold formed the AFSB based at his Fairfield Sydney home. In May 1953 he began publishing the Australian Flying Saucer Magazine. Six issues of the magazine were issued (May 1953, August 1953, November 1953, March 1954, August 1954 and February 1955). The group was initially a one man operation. In January 1954 Andrew Tomas became AFSB's "Sydney observer" and an assistant to Edgar Jarrold. Other members of this first public Australian flying saucer group, included Dr. W.P. Clifford, his wife Mrs. I. de L. Clifford, Mr. Gordon Deller, Mr. David O. Moore, Mr. Michael Duggan, Mr. Mueller-Sorau and Dr. Miran Lindtner. (See also my article in the Ufologist First Quarter 2000, “The Jarrold File” and No.6, 2002 “Andrew Tomas: Australian UFO Pioneer (1906-2001)”) By July 1955 Jarrold had abandoned his AFSB work. Sydney based UFO work was adrift. During the latter part of 1955 Andrew Tomas accepted the idea of making a New South Wales (NSW) state branch of the South Australia based Australian Flying Saucer Research Society which was run by Fred Stone. This was a short lived arrangement. Soon, the members from the remanents of the AFSB (the people listed above and others), and those of the AFSRS (NSW) branch, sort to establish themselves as an independent group. In November 1956 the group UFO Investigation Centre (UFOIC) was formed to continue the Sydney based UFO work first begun by Jarrold and Tomas. Dr. Clifford became the first UFOIC president, followed briefly by Dr. J. Greenwell (December 1958 to 27 February 1959). Dr. Miran Lindtner then took on the UFOIC presidency position, continuing an energetic and dynamic period of research and investigation. UFOIC became the centre of UFO work in NSW and provided an energetic focus for public meetings, investigations, publications and research. UFOIC embraced the appearance of television in Australia with some gusto. What seems to have been the first factual UFO programme on Australian TV was aired at 7.10 pm on Tuesday January 29th 1957 on Channel 7 in Sydney. Dr. Miran Lindtner and Andrew Tomas appeared on Australia’s first TV current affairs programme, Howard Craven’s “At Seven on Seven”. In a 10 minute segment a range of material was covered, including showing a number of UFO photos – “the Kentucky tracer bullets”, “the Brazilian discs”, the “Paris saucer”, “Adamski’s mother ship & scouts”, and the “coast guard photo of 4 luminous discs.” UFOIC published the UFO Bulletin (June 1957, September 1957, December 1957, March 1958, June 1958, September 1958, January 1959, April 1959 and July 1959) which carried information about key cases of the period. Further TV interviews with UFOIC members occurred over the following months, including appearances by Jack Kunst and Fred Phillips. The Katoomba flap of 1957 also attracted TV attention. A number of UFOIC branches and separate groups appeared in the late 1950s. The UFOIC Mt Druitt branch became an independent group but appears not to have continued after the death of its young president Dr. E. Very early in 1959. With the rash of UFO sightings around Katoomba during 1957 Terry Body became the UFOIC representative for a Blue Mountains UFO group. It seemed when the sightings abated the local group lapsed or merged with UFOIC. David Osborne Moore (a participant in the AFSB and the early UFOIC) formed a group called the Northern Suburbs Flying Saucer Research Association. It rose to some prominence with the 1959 visit of George Adamski, the controversial contactee figure, then slipped into obscurity. By June 1962 David Moore would claim he had seen 26 separate UFO sightings mainly from his Manly home since 1955. One afternoon in 1955, after having watched fruitlessly for UFOs for 11 years he claimed (1944? ), David Moore and his wife saw three within a few hours. David Moore often reported his sightings to the RAAF. On one RAAF file Sgt. Cusick of the RAAF Provost Service, Field Security Section, Sydney (March 1958) wrote, "Mounted in the backyard of his residence (North Manly) was a 7" telescope with which (Mr. Moore) claimed he and fellow members of the UFO (?) kept watch on selected nights. Also in his possession were numerous publications and charts containing information regarding UFO sightings. The services of this group were offered to the RAAF by Mr. Moore, who stated that they would keep watch on a "hush hush" basis." Not surprisingly, nothing seemed to come of this offer. Mr. Moore passed away in 1975. Even though George Adamski’s visit to Australia was a big event on the local saucer scene UFOIC took steps to distance itself from the contactee spectre, not altogether successfully. Some aspects of Adamski’s Sydney visit were at best a shambles and Dr. Greenwell resigned from the group presidency, in part over the problems. Miran Lindtner took over and helped steer the group along in a scientifically focused approach. Elements within the group had interests in diverse areas, some mystical, spiritual and even in contactee areas, such as the bizarre Aetherius Society, but none of these overshadowed the main objective focus of the group. During August, 1960, a resident of the northern Newcastle suburb of Belmont witnessed an intriguing close encounter. At about 1.30 am, Mrs. Helen Aldridge was awoken by a buzzing noise. Looking out a window she saw "a bright, round object, not unlike a large musical top" resting in an adjacent paddock only some 50 to 70 feet away. A light on top of the object "rotated and projected a yellowish white beam, illuminating the paddock, house and garden as it swept around. The object itself, however, glowed red and gold and showed a surface pattern like that of a camouflaged tank. It gave out a continuous low pitched buzzing sound." It appeared to be about 14 feet across and apparently 4 feet high, with a foot high lighted strip running around it. Mrs. Aldridge then saw a small humanoid figure, between 31/2 to 4 feet in height, approaching the house through the garden. The figure appeared to have normal body proportions. It was dressed in "an olive-green, skin tight suit of a dull material... (with) a helmet of the same material, but with a face piece of non transparent, orangey plastic-like substance." The figure also appeared to be wearing whitish-grey footwear, like basketball boots. This figure walked along the side fence (11/2 to 2 feet high) apparently looking at the ground. It climbed over the fence. When it had approached to about 10 feet from her, Mrs. Aldridge went to wake her son. When they got back to the window, the figure and the UFO were gone. They did see a bright, glowing object moving slowly in the sky about a mile away. Mrs. Aldridge kept her experience largely to herself until a relation told the UFO Investigation Centre (UFOIC) during about 1967 (UFOIC files 1967 held by the author). Another striking case occurred near Vaucluse Beach, one of Sydney's beach suburbs, at about 5.30 pm, on July 19th, 1965. Between showers and high winds, Dennis Crowe, a former technical artist with English aircraft companies, was walking along the beach, near his home. He became aware of a glow coming from what appeared to be a huge disc shaped object resting on leg like structures. The object's diameter was estimated at some 20 feet. It had a glowing, greenish blue rim, while the top and bottom halves were dull silver grey in appearance. Crowe thought a hollow in the top could have been a glass dome. He could not make out any sign of movement in the object. When he approached the object to within 50 to 60 feet, it suddenly lifted off the ground. A noise, like air being forcibly released from a balloon, was noticed. The UFO climbed rapidly and within 10 seconds had disappeared into clouds. There were no other witnesses to the encounter ave a dozen or so dogs. While the object was stationary they were all barking loudly at it. After it took off they were all strangely silent. A geologist made independent calculations at the landing site which confirmed definite traces of an unusual object having rested there. He stated that the vegetation there was dying and would remain dead for a number of years. The Royal Australian Air Force (RAAF) put forward a possible explanation for this extraordinary incident. They suggested it was a "tornado"! A striking entity sighting sighting occured in suburban Sydney, at Greenacre, on April 25th, 1969. At 7.30 pm, a woman and her daughter (11) were travelling by taxi past Roberts Park. Young boys were playing football under spotlights. The woman and her daughter spotted a "Japanese Lantern" near the trees, above and behind the spotlights. A minute later, as the taxi turned a corner, they saw it again, 30 to 40 metres away, apparently in the same spot. The Greek driver stopped the taxi. They could see what looked like a metallic craft, approximately 10 metres in diameter, with the appearance of "two soup bowls joined rim-to-rim". There was a steady red light on top. The object seemed to noiselessly rocking backwards and forwards, at a frequency of 1 to 2 rocks per second. This movement allowed some astonishing details to be seen. In cooperation initially with the Victorian Flying Saucer Research Society (VFSRS) and later also with the Queensland Flying Saucer Research Bureau, UFOIC published the Australian Flying Saucer Review (January 1960, April 1960, September 1960, February 1961, July 1961, January 1962 and November 1962). The interstate cooperative effort lapsed. VFSRS began publishing its own Australian Flying Saucer Review Victorian edition in May 1964. UFOIC published 3 issues of its own NSW edition (June 1965, November 1966 and the much delayed December 1969 issue). UFOIC also began publishing the UFOIC Newsletter beginning with Issue 1 in March 1964 and with Issue 26 by December 1969. UFOIC worked closely with the authors of the first three UFO books in Australia – James Holledge, Richard Tambling and Michael Hervey. UFOIC was profiled in James Holledge’s 1965 compilation “Flying Saucers over Australia. There was a focus on some compelling Sydney area cases in Richard Tambling’s 1967 book “Flying Saucers – Where do they come from?”, namely “the Canterbury saucer” incident of March 8th 1967 – a striking daylight disc encounter, “the Wollstonecraft Object” of February 1967 and Denis Crowe’s striking sighting of a UFO on Vaucluse Beach in July 1965. It took a few years before Tambling disclosed his own “secret life” as a contactee himself. While Tambling’s book covered some of the better recent local sightings, it was his infatuation with contactee photos (particularly those of Dan Fry and Paul Villa) that set the tone and with hindsight revealed his calling. As an Air Force photographer Tambling should have been a bit more critical, but subsequently all pretence was put aside. Tambling was a full blown contactee. His space visitors came from Uranus no less. A 400 year old alien named Namoi revealed to Tambling and his followers that catastrophe was at hand. Tambling's journey into the world of contactees ostensibly began in 1967, the year his book appeared. Michael Hervey’s 1969 book “UFOs over the Southern Hemisphere” had a foreword written by UFOIC’s secretary Bill Moser. Hervey, in his acknowledgements indicated without the help of Moser and Dr. Lindtner the book “would never have been written.” The book was not without its obvious problems. Hervey lack the judgement that comes with experience with the UFO subject, and thus low weight cases were often given prominence often at the cost of limited coverage of more substantial cases. Further still the lack of careful editing meant some avoidable errors crept into the text. Despite this the book represented a useful catalogue of Australian events. A number of other groups appeared during the sixties. In 1967 the Newcastle UFOIC was formed with Rosemary Pendlebury as its president. She supplied to UFOIC the details of the 1960 Belmont entity case. The witness was a relation of hers. The Canberra UFO Research Society was formed on September 5 1967 with Harry Zwankhuizen as president and Vicki Klein as secretary. Vicki Klein also had a “secret life” – an early abduction odyssey – which I described in detail in my book “Hair of the Alien.” She also had a sighting that featured a “UFO detector” alarm going off. The Picton Ufological Society formed in the mid sixties undertook some impressive research in the Picton area south west of Sydney. It was led by a local science teacher Ron Gunn. The group undertook extensive field work and monitoring of UFO activity in areas like Razorback and the Burragorang valley. For example during early May 1968 a field excursion to Razorback yielded 3 confirmed sightings. According to the group “the craft came so close to the observers that its shape was clearly defined with the naked eye. In addition, it caused significant secondary effects.” (Picton Post May 23 1968) The peak periods of activity were in 1968 and 1969 but monitored activity continued through to 1973. The activity of the Picton group also seemed to attract intense surveillance activities from certain quarters, possible military or intelligence, to an extent that led to the cessation of the group’s UFO research activities. The UFOIC group went through a period of crisis with the tragic accidental death of its president Dr. Miran Lindtner on August 29 1969. Frederick Phillips became president during this difficult period. A transitional period for UFOIC followed, punctuated by some internal difficulties and cooperation & discord with a new organisation UFORPA (UFO Research Projects of Australia) run by Frankh Wilks. UFORPA sought to energise and revitalise active research and investigation, and found it difficult to do this within the existing structure and then current disposition of UFOIC. Members of UFORPA even tried to take UFOIC over in December 1972 in an effort to envigorate the lapsing activities of UFOIC. The attempt was unsuccessful, but within a year and half elements of UFORPA led by David Buching did achieve this objective, but without Frankh Wilks, who by then (early 1974) had to put his UFO group activities on hold for personal reasons. A number of members of UFOIC (including Fred Phillips, Bill Moser, and Michael Smyth) participated in this process and a revitalised UFOIC was underway by early 1974. 1973 was a year of tremendous flux in UFOIC activities. Limited investigations were being undertaken by UFOIC and UFORPA seemed to be more active in this area. This was reflected in a Channel 7 TV documentary which appeared in early 1973. Written, producted and presented by news veteran and the face of Channel 7 news Roger Climpson "UFOs Fact or Fiction?" presented a lot of sighting material from UFORPA investigations. UFORPA also carried out expeditions and monitoring in the Burragorang Valley. UFORPA's attempted UFOIC "coup" in December 1972 further unsettled the remanents of UFOIC that had limped into the early 1970s. While UFORPA survived in a manner through 1973, Frankh Wilks' departure led to a diffusion effect between URORPA and UFOIC - a "marriage" that had been developing throughout 1972, then briefly aborted by years end because of the "coup" attempt. The visit of Dr. Allen Hynek to Australia in August 1973 helped the process of the diffusion of active and interested elements in UFOIC and UFORPA to combine forces in a reborn UFOIC. These were slowly nutured developments which were formalised by early 1974. As a country NSW member of UFOIC I remained largely removed from these developments, but I was receptive to any active investigation and research developments in the "on and off" UFOIC/UFORPA "marriage". These were best communicated to me by David Buching. Early in 1973 I had visited Sydney and was disappointed with the lack of focus and activity that seemed evident in UFOIC. I even found a recent investigation report of a striking close encounter I had documented (which was later published in the British Flying Saucer Review Vol. 19, No. 5, Sept - Oct 1973 as "Tractor driver under "cold scrutiny" by UFO") languishing in a pile of UFOIC case files in a exposed outside storage shed. It seemed to me at the time that UFOIC was in a drastic decline. My pessimism was short lived when my investigations of the Tyringham Dundurrabin UFO flap of 1973 attracted the attention of David Buching and his "UFORPA/UFOIC" investigation team. David and members of the team came up from Sydney (on 4 seperate occassions in July, August, October and November 1973). These visits and our close cooperation during them led me to re-evaluate the future of UFOIC. When I finally moved to Sydney in 1975 I quickly became more involved with UFOIC and joined its management committee. Out of this process emerged a revitalised UFOIC committee with an energetic investigative team lead by David Buching. It continued the UFOIC Newsletter run beginning with issue 40 in May/June 1974. By this stage the position of president was largely honorary with Fred Phillips continuing in the role. The actual running of the group was undertaken by the newer members of the committee. The Central Coast UFO Research Bureau emerged in the seventies. Based in Gosford NSW it actively conducted investigations into cases in the area, sometimes in collaboration with UFOIC. It documented a major flap in the area during 1976. Harry Griesberg and David Seargent from the group were asked by Dr. Hynek to form what became the Australian Co-ordination Section (ACOS) for the Centre for UFO Studies in 1974. ACOS would become the Australian Centre for UFO Studies which at least until the mid eighties was a strong force for a national focus on UFO research. Terry Bishop in Orange formed a group called the Central Western UFO Research Bureau. He cooperated with an investigation of an impressive UFO physical trace case near Orange in mid 1977 undertaken by a UFO Research NSW team (a psychologist Anne Brown, who later became my wife, Dr. Geoff Stevens, a scientist from Lucas Height Atomic Energy Commission, and myself, an industrial chemist). My report on that case “UFO Landing near Orange, May, 1977” appeared in the group UFO Newsletter No. 52, November, 1977. By that stage UFOIC had adopted the name UFO Research NSW. By 1975-76 Michael Smyth and myself were coordinating the UFOIC group's activities. In line with a trend established by some other state groups UFOIC changed its name to UFO Research (NSW). Fred Phillips continued as honorary president for a number of years. The last UFOIC Newsletter was issue 50 of January - February 1977 and the newsletter format continued with issue 51 appearing under the name UFO Newsletter (UFO Research (NSW)) in May 1977. Its name was changed for one issue to the Australian UFO Newsletter in the double issue N0.54 & 55 dated July - August 1978. With the No. 56 & 57 double issue dated January - February 1979 the name Australian UFO Researcher was adopted which continued until issue 60 dated November - December 1979. The Sydney based group as UFOIC and UFOR(NSW) had published 57 issues between 1964 and 1979 (3 issues 54&55, 56&57 and 58&59 were double issues) in a continuous numbered run. One compelling case investigation by UFOR(NSW)/UFOIC was the Benboyd UFO film event. At approximately 4.00 pm, on October 23rd, 1976, three young men - Nicholas Flaskas and Frank and Bill Zonaras - were preparing their cameras for the coming eclipse of the sun. They were located on top of a large cliff face overlooking the sea at Taola Point, Benboyd National Park, which is about 15 km. north of Eden, on the south coast of NSW. They had an unobstructed view in all directions. Suddenly one of them yelled out that a group of strange objects were hovering over the water close to their horizon. They all gathered to watch as the elliptical shaped objects began to move towards and away from them in an apparently controlled manner. Remembering that they had a loaded movie camera, Frank Zonaras quickly picked it up, checked the settings, and immediately began to film the phenomenon. Nicholas Flaskas took a series of still pictures. The movie camera was panned over a large area taking in one of the objects which was more prominent and at least 2 of the apparently smaller objects. Frank Zonaras paused to adjust the camera, then with it at maximum zoom, he observed that the more prominent object appeared to be revolving. It appeared to by dull grey in colour and bell-shaped. It was very clearly defined and the witnesses were adamant about what they had seen. The filming stopped as the eclipse began. The group turned their attention to the reason for being there. During totality the group kept their attention on the eclipse. After the eclipse they again looked for the anomalous objects but they were nowhere to be seen. The objects were recorded on both film and stills. "...the UO image represents a structured object of unknown origin, without any sign of misinterpretation of a conventional object or phenomenon....we feel the reconstruction pictures represent the object's "real" proportions and size." "The UO image is at a vast distance from the camera, over a mile, as determined from other foreground/background features." "The size of the UO image based on a digitizing program and the focal length of the camera is approximately 30-40 feet in its largest dimension." "The main image can not be compared to any type of helicopter or aircraft." "The main object is being affected by low horizon atmospherics, substantiating the distance of the UO." "The image is one of three dimensional proportions and definitely appears as a structured object." While some elements of the GSW computer enhancement technique were controversial their conclusions add support to an intriguing piece of photographic evidence. In 1980 UFO Research (NSW) (aka UFOIC) joined forces with the cooperative publishing venture UFO Research Australian Newsletter (UFORAN) edited by Vladimir Godic. By the early 1980s the UFOR (NSW) group was reconfigured, adopting a networking type approach, rather than continuing the traditional public group format. This change worked well with a good working relationship with national networking efforts, initially with the Australian Centre for UFO Studies (ACUFOS) and then UFO Research Australia (UFORA) from 1984 to 1995. A spate of activity including some apparent close encounters, occurred in NSW, during June and early July 1983. During that period there was a rash of puzzling radar "paints" from Sydney Airport (Mascot). More than 30 unidentified radar returns were recorded. None were correlated with any visual sightings. When word leaked out, widespread media attention occurred. The RAAF initiated, with perhaps tongue in cheek, what their UFO files called "Operation Close Encounter", which led to RAAF aircraft being on standby, to pursue any verified correlated returns. They finally concluded the returns were probably spurious. A major flap then broke out in NSW, centred in the Gosford/Central coast area, during late July and early August 1983. UFOR(NSW) undertook investigations into these events. By coincidence, one of the largest UFO exhibitions in the world, opened in Sydney's spectacular Centrepoint Tower on August 18th, 1983. It ran for about 2 years. UFOR (NSW) participated in this exhibition. The networking format with a national focus adopted by UFOR (NSW) from the beginning of the eighties allow myself and associates to undertake extensive work on specialised research projects such as official Australian UFO investigations and abduction events. These programmes continued into the nineties (once again under the name of UFOIC) and led to extensive documentation and research in both areas. In particular my research between 1982 and 1984 into the Australian government defence UFO files was widely documented (e.g. UFORAN magazine over 3 issues during 1982, and Omega Science Digest, Sept.-Oct. 1982). In 1988 Moira McGhee with Bryan Dickeson co-founded the Independent Network of UFO Researchers (INUFOR). Initially a limited venture it became more active by 1995 with the appearance of the INUFOR Digest edited by Moira McGhee. The UFO Research (NSW) group that operated from 1977 under my direction readopted its original name UFOIC in November 1991 when a name change was forced by a new group registering the name UFO Research (NSW) as a business name. To minimise the confusion with the new UFO Research (NSW), the work of the original UFO Research (NSW) from 1977 to 1991, may best be seen as a phase of UFOIC during which it shifted (in the early eighties) to a low profile research network under my direction (see my web log on UFOIC’s history: http://ufoicaustralia.blogspot.com in particular the January 4 2007 post: “The evolution of UFOIC”). The new UFO Research (NSW) was led by Bryan Dickeson, Paul Sowiak and Moira McGhee. It adopted a public group profile, running public meetings and intermittently publishing a newsletter the “UFO Reporter” until 1996. The Reporter reappeared in 2001/2002 but was subsequently replaced by a group newsletter. One of the more interesting cases the new UFO Research (NSW) examined was a close encounter event at Kyeemagh near Sydney International Airport on April 19 1992. Four people observed a disc-shaped object for over 10 minutes. It eventually departed in an unusual erratic jump motions. During its presence the nearby Kingsford Smith Airport control tower appeared to have been affected, with an alarm sounding. Subsequently the control tower claimed nothing unusual occurred. The case was written up in the UFO Reporter in June 1992 and was included in Timothy Good’s book “Alien Update” (1993). UFOIC continued its research and investigation, preferring a successful model of a "low profile" active network, rather than a public relations group format. This approach had served the group well and continues today under my ongoing direction. Through this UFOIC network I was able to coordinate extensive investigations into alien abduction cases, in particular the experiences of Kelly Cahill and Peter Khoury. I was able to get my book on the Australian UFO experience “The OZ Files” published in 1996. When my initial study of the biological evidence associated with Sydney abductee Peter Khoury’s 1992 experience appeared in the International UFO Reporter and the Ufologist in 1999 it began a remarkable journey into an alien DNA paradigm, which I am still examining. A specialised subgroup of UFOIC was formed to focus on these aspects – the Anomaly Physical Evidence Group (APEG). The forensic perspective on alien abduction evidence indicated that substantial progress could be made. The work attracted funding, which enabled further focused work and the publication of my book “Hair of the Alien – DNA and other forensic evidence of alien abduction” (2005). In 1992 Peter Khoury and Jamie Leonarder formed a support group for UFO experiencers, initially within the new UFO Research (NSW) group. Problems developed and on April 14, 1993 the support group became an independent group – the UFO Experience Support Association (UFOESA). The group under Peter Khoury’s direction became one of the most notable manifestations of the support group concept in Australia, helping witnesses and experiencers of UFO events cope with and understand their encounters. For a few years Jamie Leonarder and Michael Williams operated a group called ALERT (Anomalous Light & Energy Research Team) which focused on unusual light phenomena such as Min Min lights and remote outback mystery lights. Conflicts within the new UFO Research (NSW) group led to Moria McGhee leaving the committee. This allowed her to concentrate on the Independent Network of UFO Researchers (INUFOR) from 1995. INUFOR provided a focus and forum for smaller groups and independent researchers. These included Paradox based in Nowra from 1996 with Robert Goss, UFOLinx with Sylvie Orville-Blue, Quest Australis with Allan Craddock, and Rex Gilroy’s Blue Mountains UFO Research group based in Katoomba. 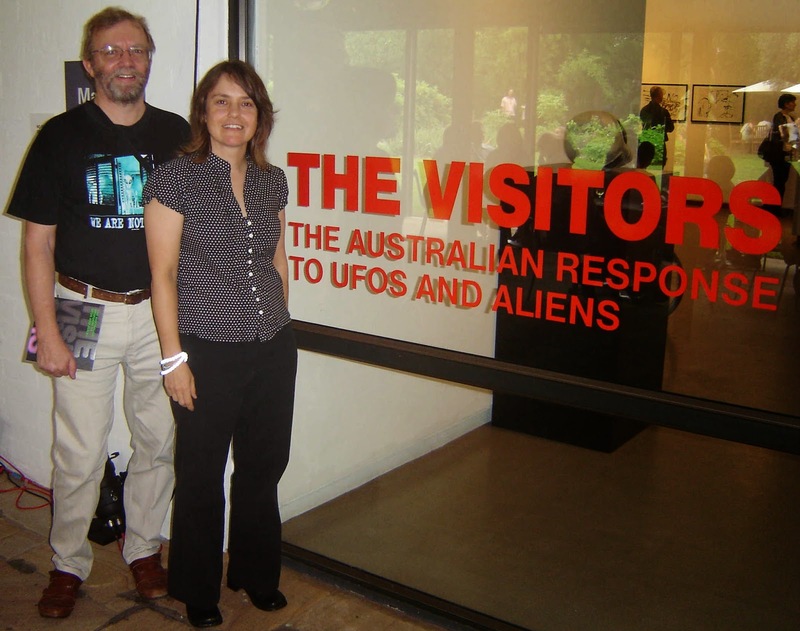 Apart from research into diverse mysteries in Australia Rex and Heather Gilroy undertook NSW based UFO research and conducted regular meetings. They published two books to date on the UFO subject “Australian UFOs – Through the Windows of Time” (2004) and “Blue Mountains Triangle – Australian/American Underground Bases and the ET connection” (2007)). Moira McGhee and Bryan Dickeson co-authored an INUFOR book “The Gosford Files – UFOs over the Central Coast of New South Wales” which appeared early in 1997. Other groups and individuals which appeared and operated within NSW during this period included Doug Moffett (who initially operated on the South Coast of NSW, before joining UFOR (NSW) when he moved to Sydney. Later he would co-host with me an internet based TV show “UFO” on the Banana TV web site, which produced more than 20 episodes devoted to various aspects of the UFO subject), Mike Farrell’s Project UFOVac (which concentrated on disseminating UFO programmes and videos), UFO Abductions & Contacts based at Wentworthville (Paul Bonet), UFO Australia Encounter based at Parramatta and operated by Matthew Favalaro and Robert Marx (focusing on abduction experiences and hypnosis support), Lightning Ridge UFO Watch, INFODIG (based on the Central Coast and providing a discussion group focus run by Derek Bott), Graham Stewart (who through SA Research and UFOtec provided some photo analyses and interpretations of UFO events in the context of New Zealand pilot Bruce Cathie’s UFO grid theory), Paranormal Western NSW based in Orange (with Debra Goninan & Russell Dunn who undertook some investigations for a few years) and others who seem to have come and gone. In August 2000 a new group appeared based in the Campbelltown area. The UFO Society of Western Sydney (UFOSWS), with Attila Kaldy as its president. undertook an active public lecture/meeting programme, sightings investigations and a series of expeditions focused on the Blue Mountains, the Burragorang and Sydney northern beaches. The group produced a video “The OZ Unknowns” which in part focused on a controversial sighting, video and abduction milieu in June 1999. UFOSWS has two specialised divisions – RACE (Research of Australian Close Encounters) and PR2D (Paranormal Research Second Division – which focuses on evidence for haunting). Between 20 October 2001 and 26 January 2002 the Liverpool Regional Museum managed by Ricardo Peach put on a major exhibit “UFOs in Liverpool: The Extra Dimensions”. The curator was Chris Downie and the project was facilitated through the close co-operation and support of UFO Research (NSW). The exhibit included artworks, drawings and images from a number of experiencers including Kelly Cahill, Tracey Taylor, Scott Longley, Suzanne Hanson, and Peter Khoury. Material was supplied from groups like ACERN, PRA and UFOIC. A broader and larger focus on UFOs, aliens and art came about when the Penrith Regional Gallery & the Lewers Bequest commissioned a unique and striking art exhibition which ran at the gallery just outside of Sydney from 8 December 2007 to 17 February 2008 – “The Visitors: The Australian Response to UFOs and Aliens.” For me it was a wonderful conjunction of two of my long time interests – art and UFOs. When the exhibition organisers originally contacted me to get me on board as a consultant and writer I asked what they had in mind, perhaps a single room display. No, it turned out the whole of the multi-roomed gallery was turned over to the exhibition. 15 established artists contributed a body of fascinating works ranging from paintings, sculptures, installations and other artistic media expressions. I contributed an essay “The OZ Files Unbound” and recommended reading list for the 64 page exhibition catalogue, extensive material, including case files for an evidence room and a walk through lecture covering the evidence and my take on the exhibition artworks. The exhibition was well received and highly successful. The national network AUFORN has operated in NSW through Larraine Cilia, who is now president of UFO-PRSA (formerly UFOSWS). While independent researchers continue to contribute to UFO research and investigations in NSW the bulk of research and investigation seems to be undertaken either through my group UFOIC, UFO Research (NSW), UFOSWS, UFOESA and AUFORN. Public meetings are regularly put on by UFOR (NSW) and UFOSWS. Conferences have been organized by UFO Research (NSW), UFOESA, UFOSWS (now UFO-PRSA) and AUFORN. Thus a diverse and dynamic range of groups and individuals continue to undertake UFO research and investigations in New South Wales, adding to the long and potent tradition of UFO work in this state. As of 2014 UFO Research (NSW) Incorporated (incorporated in 2007 - current president Mariana Flynn) and UFO – PRSA (UFO and Paranormal Research Society of Australia, formerly UFOSWS) (current president Larraine Cilia) continue to put on regular public meetings. During 2014 UFO Research (NSW) Incorporated ran an investigator’s training workshop seeking to develop a depth of investigation resources in the group, beyond its main public relations focus. In 2012 it created a division called Exopolitics Sydney led by Maree Baker focusing on regular discussion of “the Extraterrestrial Phenomenon.” Recently the propensity of some individuals to seemingly become “lightning rods” for UFO activity was given a sharp focus with the UFO sightings, films and photos taken by Damien Nott. He formed a group call AAPI – Australian Aerial Phenomena Investigations to continue this approach. Here are two UFOIC investigation the author did of striking UFO events in 2007 and 2008. Early Sunday evening January 7th 2007, a security guard at a factory in Baulkham Hills, a northwest suburb of Sydney captured a UFO with a digital camera. James had a 31 years experience in security work and had been working at the factory site for a number of years. At around 7.40 pm local daylight saving time it was dusk with the diminishing light evident on the horizon. He was in the entrance security office which is situated on the entry road immediately inside the factory gate. The gate was closed. James had looked to the south - the entry gate direction - and saw a clear sky. After looking away for about 5 seconds he was surprised to see a "long black thing" in the sky just above the powerlines. It seemed to have a grey halo or cloud around it. As the object seemed to be moving towards his position James grabbed his digital camera - A Pentax Optio 3.3 mp 3x200m Pentax lens - and walked outside the security office. He could see that there appeared to be a cloudy light inside the halo moving from end to end across the top surface of the black shape. He got the impression that there was like a heat haze simmering effect. James took one photo. Then suddenly the object seemed to go in reverse, approximately along the light of sight, decreasing in apparent size and within about 3 seconds had disappeared from view. Examining the photo James found that the image had captured the apparent angular size of the object but had not recorded the halo effect he had observed. I was particularly interested because the object had seemingly shown movements witnessed in an event I also investigated from January 26. I spoke with James on February 1st and conducted an on site interview with him later that day. Despite his experience with the location and the night sky James was unable to reconcile the strange object with any known source. I investigated a fascinating landing/entity encounter case at Coogee, a seaside Sydney suburb that allegedly occurred at about 4 am on February 29, 2008. A man walking down a street, observed a flash of light. In that direction he saw a large spherical shaped object sitting on the street T intersection. He could see a little man in a window at the top of object. The witness became frightened, retreating behind a large electrical signal box. The being appeared to move a lever, a “shutter” came down over the window area, and the object took off at tremendous speed at about a 45 degree angle. The bitumen road surface appeared to have a white circle effect left behind and at least one nearby tree appeared to have been burnt. The witness reported noticing heat coming from the object. The duration of the incident was about 5 minutes. The road surface was repaired soon after by local council road maintenance crew as the road is a very busy route mainly during the day. I met the witness on March 19. I first visited the site on the night of March 19 and have revisited the area on a number of occasions since then. I acquired samples of the burnt tree bark. I was also advised that soon after the incident a new electricity telegraph pole was placed at the intersection and repair work was undertaken on the electrical wiring connections. Investigations undertaken to see if these matters are related to the February 29 event were inconclusive. The witness is a shy man of nervous disposition and seems unlikely to be the type that would make up a story of a UFO incident, and did not appear to have much knowledge of the UFO subject. Despite this, I was very struck by the similarity of the Coogee witness’s description and drawings to two remarkable overseas cases – Cussac, France (August 29, 1967) and Goffstown, New Hampshire, USA (November 2, 1973) – both featuring a similar UFO and apparent alien entities. The startling similarity of these cases, over several decades from different parts of the world, is an extraordinary wink at the enduring reality of the UFO experience. At Cussac 2 young children witnessed a group of entities, initially on the ground around a spherical shaped object, then float up and enter the UFO as it was departing in a helicoid trajectory, leaving behind a sulphurous like odour and a slightly depressed yellowed grass trace 4 to 5 metres in diameter. This case was subjected to extensive civilian and official investigations, and held an enduring fascination for the aerospace scientist Dr. Claude Poher, who would later lead the French official UFO agency GEPAN. In the Goffstown case a Mrs. Morel reported having a frightening early morning close encounter in which a spherical UFO hovered above her car, seemingly largely controlling the vehicle. She could see an entity inside an oval window at some sort of console, and apparently experienced a telepathic message not to be afraid. However she was very afraid and managed to steer her car into a house driveway and ran to the door eventually waking up the occupants, who called police. The author welcomes further information on any of the groups and individuals who have contributed to the New South Wales spotlight on UFOs, particularly on others that have not been addressed. I can be contacted via billozfiles@tpg.com.au or P.O. Box 42, West Pennant Hills, NSW, 2125. Because of my close association with UFOIC through its various phases from the late 1960s I have been researching the history of UFOIC. Some of this material is on this blog site I manage http://ufoicaustralia.blogspot.com I welcome your interest and support in providing information about UFOIC.